Luxcel's MitoXpress® Intra – Intracellular O2 Assay is a highly flexible 96 or 384-well fluorescence plate reader-based approach, for the direct, real-time analysis of cell oxygenation within the cell monolayer. The easy to use MitoXpress® Intra assay enables molecular O2 to be conveniently monitored within the cell monolayer on a plate reader in a non-invasive, high-throughput manner and in real-time. 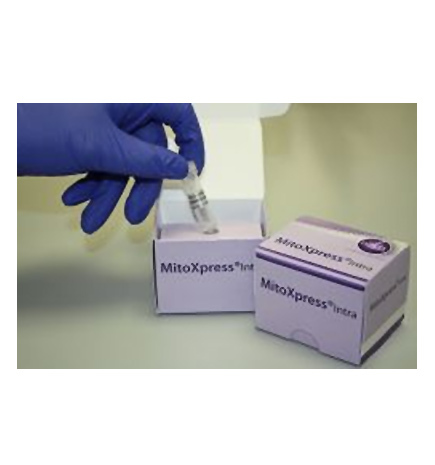 MitoXpress® Intra is a powerful tool that facilitates the real-time assessment of transient changes in cell respiration, oxygen gradients and physiological responses across a range of cell models. Molecular oxygen is the key substrate of aerobic metabolism. Knowledge of cell oxygenation is therefore central to a detailed understanding of the cellular metabolic response to a particular treatment or manipulation.